as·sem·blage | \ə-ˈsem-blij | A group of things collected…a sculptural technique of organizing into a unified whole a group of unrelated and often fragmented or discarded objects…scraps, junk, odds and ends. Expand Your Art With Encaustic! 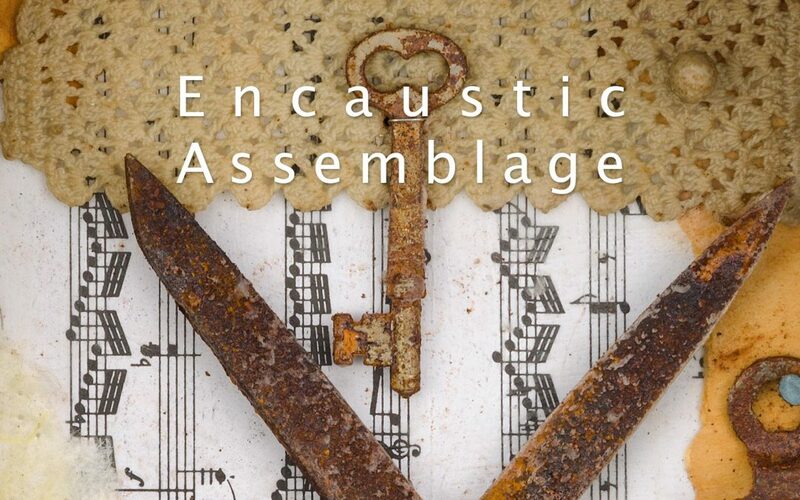 Join visual artist Candace Law on Saturday and Sunday, October 28–29 for a two-day encaustic assemblage workshop. It will feature an exploration of the sculptural technique of using found objects and encaustic to create assemblages. You’ll be working both inside the studio and outside, weather permitting. Some experience working with encaustic is needed. Visit EncausticAssemblage.eventbrite.com for more information and to register. An informal gathering at the beginning of the day for art conversation over coffee/tea/pastries. If you have tried using found objects and assemblage in your art, bring a work in to show and discuss. Or bring in the name of an artist whose work incorporates this technique and we’ll look them up. A review of some basic tools and simple mechanical ways to attach objects to panels or other surfaces. Demonstration of ways to incorporate encaustic with painting or pouring techniques. The equipment, supplies, and many materials needed for the workshop are provided. You will want to bring your own found objects and various items to incorporate into your artwork, as well as things you might like to swap with other participants.